Scrapping On The Cheap: GREENPEACE Caught Dumping Decommissioned “Rainbow Warrior 2” On Bangladeshi Beach! Browse: Home / 2018 / December / 30 / Scrapping On The Cheap: GREENPEACE Caught Dumping Decommissioned “Rainbow Warrior 2” On Bangladeshi Beach! Chalk up another one for hypocrisy. Do as I say, not as I do! From Greenpeace. Whenever someone else makes a “mistake”, do-gooder organizations like Greenpeace are quick to demand resignations, hefty penalties and punishment. Yet when these same organizations get caught doing wrong, they all claim how it was all a mistake, just a misunderstanding, an honest oversight, etc. and then plead for forgiveness, which they feel they alone are entitled to. Greenpeace environmental protection ship winds up polluting the environment while being scrapped later on a Bangladeshi beach. Photo (2006): public domain. The latest involves Greenpeace’s dirty scrapping of its retired Rainbow Warrior II ship on a Bangladeshi beach under horrendous environmental and social conditions, Spiegel reports here. Greenpeace has always been a harsh critic, and often justifiably so, of ship-scrapping under awful environmental, work and social conditions in third world countries like India or Bangladesh. So it’s surprising to hear that the famous environmental protection organization has been caught breaking its own Commandments (probably to save money). In a statement on the decommissioning of Rainbow Warrior II by Greenpeace International in Amsterdam, the organization wrote that they “made a mistake” in allowing the decommissioned ship “to be scrapped on a beaching yard in Bangladesh” in a way that “does not live up to the standards” they themselves have set. In the statement there is no mention of any resignations, or massive fines arising from their admitted environmental and social transgressions. The statement was not even translated in German and so did not even appear at the German Greenpeace website (Germany is a generous donor to Greenpeace). Whenever big corporations get caught doing similar mischief, Greenpeace is often the last to forgive and always first in line to demand consequences, reparations and punishment. 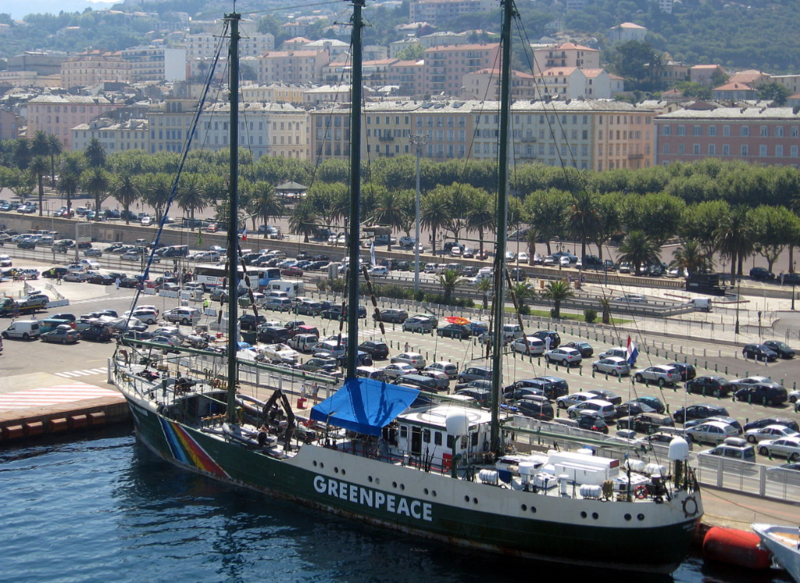 The practice of chopping up decommissioned ships like Rainbow Warrior II is often done on the beaches of third world countries where the task is “fundamentally unsafe, exploitative of workers and damaging to the marine environment”, Greenpeace says. Yet the high profile environmental organization could not be bothered to ensure a proper disposal of its own ship. Greenpeace added that they would seek to ensure that specific wastes that couldn’t be treated safely, ‘downstream’, in Bangladesh could be sent out of the country for management. Spiegel wrote that the affair has damaged Greenpeace’s reputation: The German news magazine wrote online: “Instead of making their own mistakes as transparent as possible, Greenpeace tries to minimize the damage as long as possible” and it was “too late for controlling the damage”. Greenpeace has finally recognized that safe and responsible recycling using the beaching method can be conducted in the Indian subcontinent and that Bangladesh specifically can be a green recycling destination. Also read about Greenpeace and the NAZCA lines here. For more info on shipbreaking, watch this video here. Anyone remember the Nazca line stunt. First they lied and said that their people were very careful and then video evidence exposed that lie. Then it was like pulling teeth to get from them the names of those responsible. Then they claimed it was just a “mistake” and not illegal activity which is also a lie. Thanks – added a link! When we transferred the ship to Friendship in 2011 we retained the right of veto over any final disposal plan. She became a Bangladeshi ship, owned, operated and flagged and only licensed to sail inland and coastal waters. Given its condition, we presumed it would need to be decommissioned in the best way possible in Bangladesh. As proposed by Friendship. We should have consulted our partners in the NGO Shipbreaking Platform and the Basel Action Network, we did not. No excuse. We should have. You ****ed up. And not for the first time. As Goldfinger put it, once is happenstance; twice is coincidence; thrice is a declaration of war! You are serial offenders who believe the laws of civilised behavior don’t apply because you have lofty ideals instead. Go read the Heartland report — which did no more than confirm what many of us have known for years! And just occasionally try a bit of genuine humility. Wanna know why they went the cheap route rather than traveling the high ground? Look at their books. Focus on 2017 liabilities (esp. vs 2016). Big hemorrhaging there. The ONLY way to get this to change is for the individuals and entities funding Greenpeace to demand accountability. That means the Greenpeace Board, the CEO, the COO and the Legsl Counsel taking a sizable pay-cut. Period. Everything else is childish, skirting responsibility. Make them personally pay for their hypocrisy or they will repeat the practice, over and over and over. This is just human nature. Noble cause corruption is even worse when most of your causes are made up ones. Stop press: squirrel in Bangladesh! cos when Rainbow Warrior to Friendship 8 years ago to become a hospital ship they did have an agreement that end of ship-life would be properly done. #2 But reporting should make it clear that it is not Greenpeace itself that is scrapping the ship, but rather its cousin organisation. From what I can find, you seem to be correct. G.P. probably should have foreseen the problems though. It’s what they would demand of everyone else. Has anyone yet mentioned the fact that the Greenpeaz is/was powered by diesel? Watch/listen from there (25:51) thru 27:03. Yeah, can’t wait to see a wind/solar powered Greenpeace ship set sail. Still, don’t you suppose they should be allowed some sort of “AUXILIARY POWER”? …to be used only in cases of emergencies and when it’s funny. Also of note is this “The row comes after Pascal Husting, Greenpeace International’s Programme Director, was exposed earlier this year as having commuted the 250 miles between Luxembourg and Amsterdam by plane since 2012. Each trip is believed to have cost Greenpeace £200 and would have generated 142kg of carbon dioxide emissions, it was said. And also show their duplicitous nature when trying to con Dr. Roy Spencer with front-group (or fictitious group?) for Greenpeace called “Hamilton Ellis”, supposedly headquartered in Beirut. Not a nice bunch of people to be associated with, not moral, just, or considerate for people at all! Don’t forget how some try to blind the crew by pointing lasers at the ship. Blind those navigating the ship, and the results could be disastrous. You are correct. These types of activists are NOT good people. And another disaster by Sea Shepherd. Their seamanship leaves MUCH to be desired.